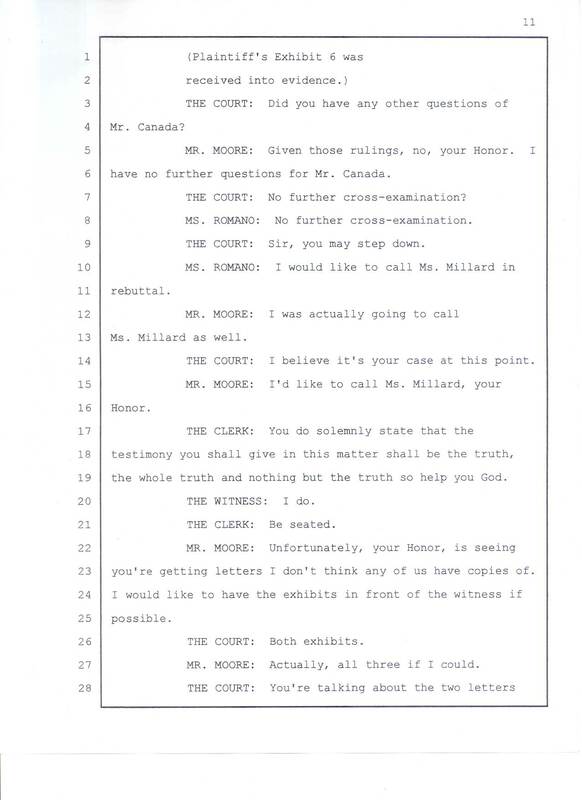 5 		MR. MOORE: Given those rulings, no, your Honor. 6 I have no further questions for Mr. Canada. 7 		THE COURT: No further cross-examination? 8 		MS. ROMANO: No further cross-examination. 9 		THE COURT: Sir, you may step down. 13 Ms. Millard as well. 14 		THE COURT: I believe it's your case at this point. 19 the whole truth and nothing but the truth so help you God. 20 		THE WITNESS: I do. 21 		THE CLERK: Be seated. 23 you're getting letters I don't think any of us have copies of. 26 		THE COURT: Both exhibits. 27 		MR. MOORE: Actually, all three if I could.